GRAND FORKS, N.D. — The first order of business for the new Grand Forks Air Force Base commander is figuring out how to fly the aircraft that defines the operations he will manage. Col. Rodney Lewis moved his way up the military ladder flying mammoth C-17A transport planes, but later this fall he's going to take the controls of an unmanned aircraft for the first time in his career. The base, once known for bombers and air refueling tankers, is now home primarily to the Global Hawk and Reaper drones. "I'm excited to learn about that," Lewis said. "I can tell you that all the airmen I've talked to that actually do that mission seem to enjoy it immensely." The primary mission of the base, which opened in 1957, was changed in 2013 to the launch, recovery and maintenance of unmanned aircraft. That mission has "gained a lot of traction" within the Air Force, Lewis said, and has ushered in a new generation of airmen — perhaps one in his own household. "I have a 16-year-old son, and if I asked him if he would rather fly C-17s around the world or fly UAS, he would pick UAS to be honest with you," Lewis said. It's not clear what plane or planes Lewis will be flying. 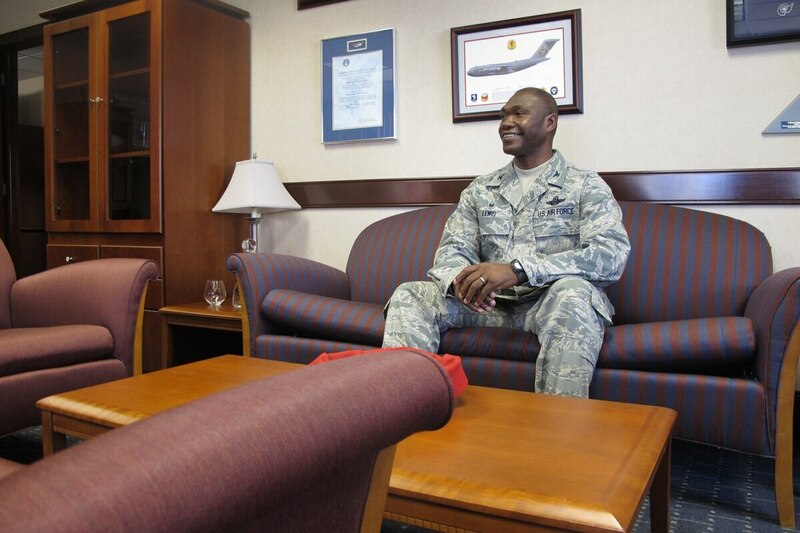 He took over command on the 319th Air Base Wing on July 1. Lewis comes to Grand Forks from Joint Base Elmendorf-Richardson in Alaska, where he had been 3rd Wing vice commander since May 2013. He inherits a base that has gone through numerous upgrades in the last decade, including new runways, lighting for the runways, air traffic control tower, workout center, and other facilities. "The physical state of the base, that is probably the first thing you notice as you drive through the gates," Lewis said. "It's the beauty of the base. It's not as big as some of the other bases, but the amount of new infrastructure and the amount of construction that is going on ... you can see that the base has been well-cared for." Lewis, who describes himself as a "relationship kind of guy," said he's also impressed by the association between the base and the Grand Forks community. He cites the signing of an enhanced use lease agreement between the Air Force and Grand Forks County for a drone tech park as "a unique example" of the partnership. The military is providing 217 acres on the base for the Grand Sky park, which will have aerospace and defense technology giant Northrop Grumman as its anchor tenant. The 1.2 million-square-foot facility is the first of its kind in the nation and will include multiple buildings, four of which will be hangars. "That relationship between the base and the community is so important for everything that we do here and that's not lost on me," Lewis said. "We bear a responsibility to be good citizens." Lewis graduated in 1991 from the U.S. Air Force Academy in Colorado. He has a bachelor of science degree in human factors engineering. He also earned a master's degree in systems management with honors from the University of Southern California. Lewis was a four-year letterman and standout running back at Air Force, once scoring four touchdowns in one game. He rushed for 74 yards in helping the Falcons to a 23-11 upset of Ohio State in the 1990 Liberty Bowl, which was his last football game. "We won that game with some cadets who were probably 220 pounds soaking wet against a team with future NFL stars," Lewis said. "It's amazing what you can do when you have a team that works together." Fisher DeBerry, Lewis' coach at Air Force, said in an interview before the bowl game that Lewis was a model cadet. "He's a tremendous young man. He's happy, he's sensitive to other people, he's a fun guy to be around," DeBerry said in October 1990. "He'll be a great leader in our Air Force and in our country. He's what you want your son to be like. I have as much respect for Rodney Lewis as anyone who has come through here."